March 29, 2016  The biggest party in Dilma Rousseff's coalition has pulled out, severely wounding her government. She is accused of manipulating federal accounts to mask the real state of the country's economy. March 28, 2016  Though gun violence takes a huge toll in Brazil, there's a push to relax gun laws. And many of the arguments are similar to the ones in the U.S.
March 22, 2016  Newly released audio of conversations by senior Brazilian officials has raised legal questions about secret wiretapping. The chatter reveals rampant sexism, even in a country with a female president. March 18, 2016  Brazil's wave of street protests reflects deep discontent with the country's culture of corruption. Dozens of public officials are implicated in a scandal involving the state-run oil company. March 18, 2016  President Dilma Rousseff named a former president charged with corruption to her Cabinet. 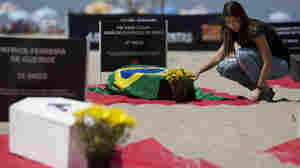 Brazil's Congress has formed a committee to begin investigating the charges. March 17, 2016  Brazil's president is teetering as angry crowds protest her attempt to name her predecessor to her cabinet — in what critics say is an attempt to shield him from prosecution. March 15, 2016  After record-setting protests over the weekend, Brazil's government is scrambling to stay in power amid calls for the president's impeachment. March 14, 2016  Brazil is in the midst of an economic downturn. It's battling the Zika virus. And a deepening political crisis has sparked massive protests and calls for the president's resignation. March 14, 2016  Brazil faces its worst recession in nearly a century, and a fraud scandal has ensnared an ex-president. 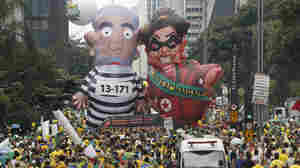 Scores of demonstrators are calling for the impeachment of current President Dilma Rousseff. March 5, 2016  NPR's Lourdes Garcia-Navarro reflects on the debate over the casting of Zoe Saldana in the role of iconic jazz singer Nina Simone. 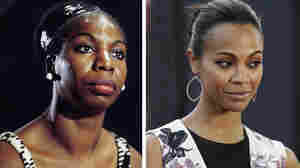 Saldana wore makeup to darken her skin and look more like Simone. February 27, 2016  Facebook now sports "reactions" beyond the like button. 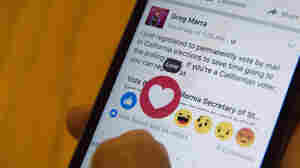 NPR's Lourdes Garcia-Navarro says emojis are great for everyday communication, but they fall short of truly expressing empathy. February 18, 2016  There have been several cases of abandoned babies already — at least three in Rio. And a psychologist believes that some men will walk out on their partner if a newborn has the birth defect. February 15, 2016  Brazil is fanning out 200,000 troops to battle mosquitoes. It's part of larger efforts to combat the transmission of the Zika virus, which has been linked to brain abnormalities in Brazil. 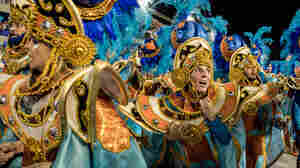 February 8, 2016  NPR's Lourdes Garcia-Navarro dons a costume and participates in a Carnival parade in Brazil.